Are you dreaming of going on a cruise holiday this year? In that case, you should start planning and saving now. The earlier you do so, the better your chances of finding good deals. Of course, we want to help you plan an unforgettable cruise vacation and this is why we’ve come up with a list of the best cruise holidays for 2015. Evidently, a key feature of the best cruise holiday is your choice of cruise line and in this regard, you cannot go wrong by choosing Crystal Cruises, which has once again bagged the highest award for the 2015 Best Luxury Cruise Lines, it’s second feat in the last 2 years. You can also choose to go with Silversea Cruises which earned the second highest award, followed by Regent Seven Seas Cruises. 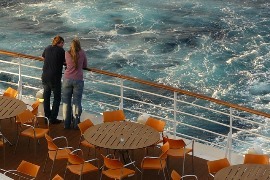 You can also opt for cruise holidays that give you more value for your money. For example, you can go with Royal Caribbean which allows you to take advantage of skating rinks, surf simulators, zip lines and a dozen other amenities for low prices. If you plan to bring along your young kids, then there’s no better choice than to go with Disney Cruises. Small kids and even children up to 14 years old will definitely enjoy all the Disney characters and educational programmes in store for them aboard the Disney cruise ship. But that does not mean adults will just get bored on their vacation. There are adults-only restaurants, lounges and nightclubs to keep moms and dads entertained too. If the reason you’re going on a cruise vacation is because you want to spend more time with your significant other, then Silversea Cruises is the top choice. There are customised activities that are perfect for romantic couples including wine tasting, dance lessons and many more. In Europe, survey shows that the best cruise vacations can be enjoyed aboard the Silver Whisper which offers a 10-night cruise across the Baltic and Russia, 23 nights from Sydney to Hong Kong, 17-night Caribbean cruise, and even a 17-night transatlantic cruise. This is followed by Oceana’s Riviera, which offers a 10-night Mayan Mistique cruise, 15-night Ancient Empires cruise as well as a 24-night Voyage of Artistry cruise which will take you from Miami to Barcelona. Every year, hundreds of thousands of people go on a cruise vacation and have the time of their lives aboard luxury ships that offer many wonderful amenities, delicious gourmet food and exciting activities. If you are planning to go on a cruise this year, make sure you plan ahead and book your tickets early to avail of discounted rates and even promotions. And don’t forget to buy cruise travel insurance so that you are protected. Cruise travel insurance gives you peace of mind so that you can enjoy your well deserved trip without worrying about anything!